For a hotel nerd like me, Palm Springs is like an archaeological site that's just teeming with hotel history. 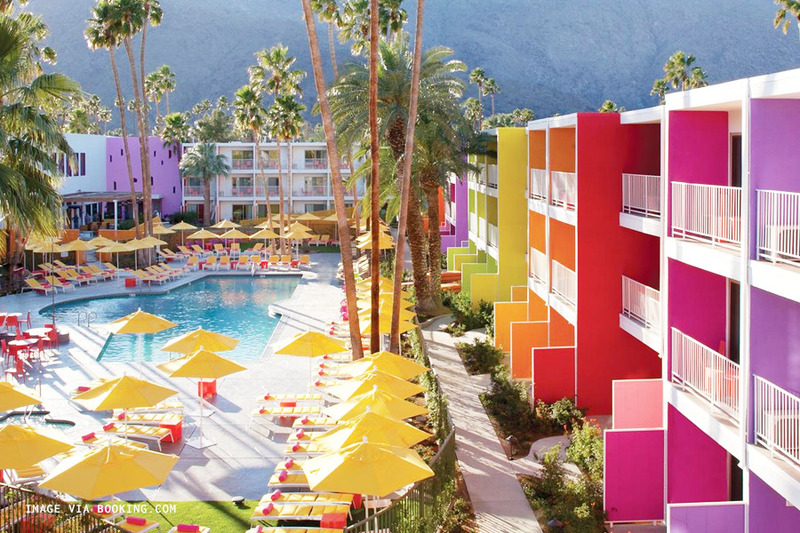 Almost every hotel in Palm Springs has lived multiple lives, starting from the modern oasis' hollywood heyday in the 50's, to a depressing state of decline in the late 80s, and its recent resurgence as a hip and youthful vacation destination. What I love about Palm Springs is that it's particular brand of 'jet-age' mid-century modern is simultaneously a dream of the future and an American vintage. The Ace Hotel & Pool Club is arguably the biggest game in town right now when it comes to where to stay— and for a good reason. The spacious suites are reasonably priced, their weekend pool parties are always poppin', and one of the best diners in town is located right on site. Not to knock the Ace but it represents just a small sliver of the magic of Palm Springs. Another interesting thing about Palm Springs is how tightly the vacation rental scene is tied to the hotel scene. 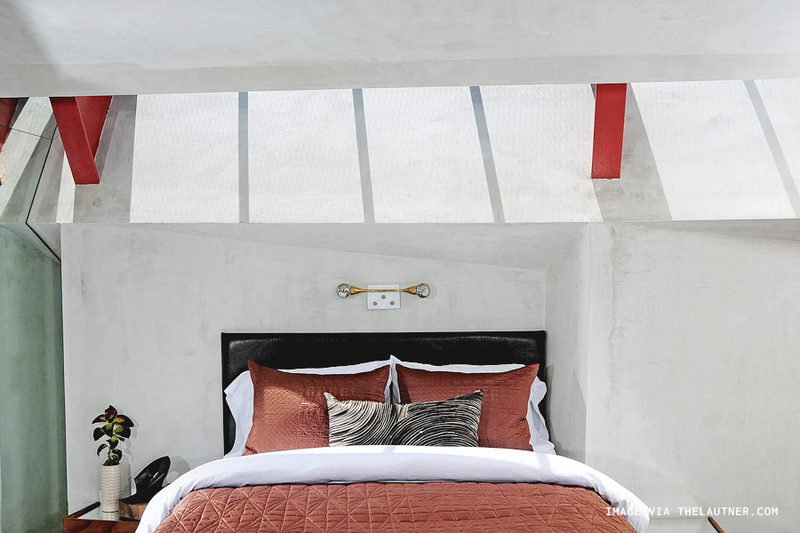 The lines are blurred, with rentals offering hotel-quality service and design at a smaller scale. 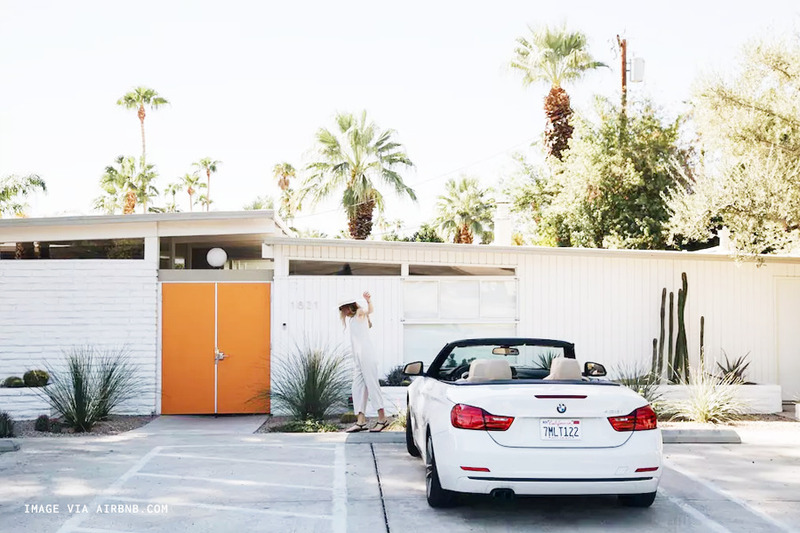 If you're interested in learning more I recommend checking out this New York Times article from last spring about the recent advent of vacation rentals and the influx of younger tourists in Palm Springs. Rates are based on a one-night search for April 2018. You may recognize the Amado's iconic orange doors, which have been splashed across magazine covers and all over Instagram. 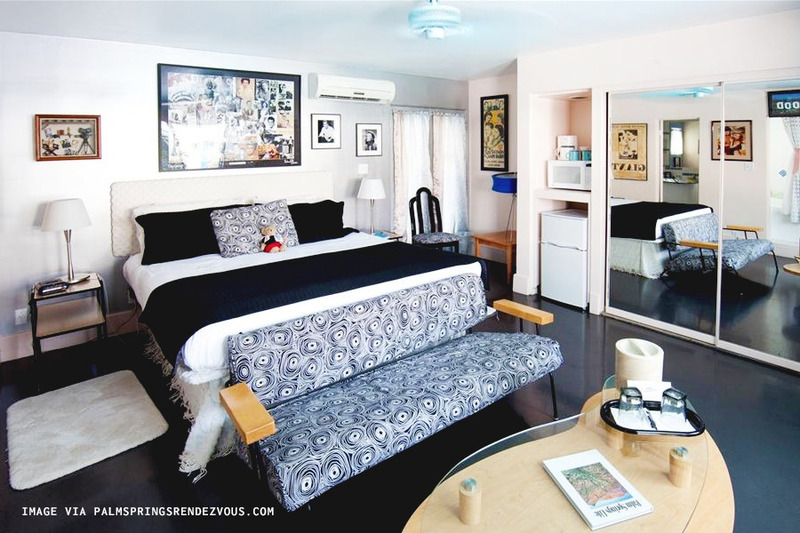 The 1955 mid-century modern complex consists of five units which can be booked individually or all-together for large groups. Desert Collective, the group behind The Amado, is also responsible for local hotspots Ernest Coffee and Bootlegger Tiki. Rooms at The Amado are wheelchair accessible. 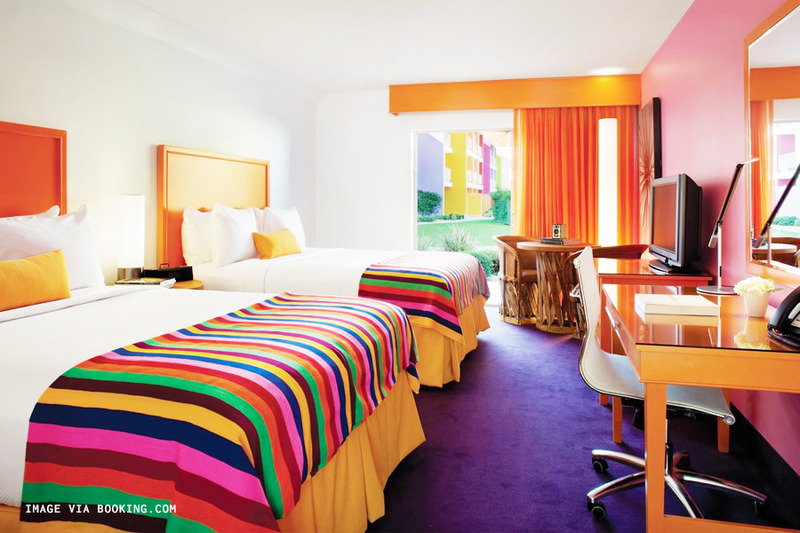 Named after a species of cactus local to Arizona (where the original Saguaro hotel is located), the Palm Springs location is familiar to most due to its rainbow colored walls and poppin' pool parties. What you may not know is that in its previous life, the hotel was actually a Holiday Inn. 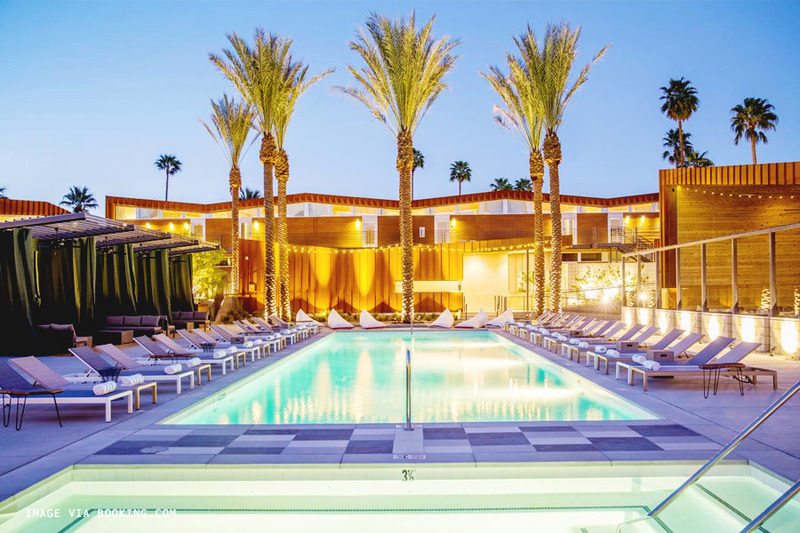 California-famous boutique hotel group Joie de Vivre brought the Saguaro concept to life in 2012 and last year passed over management to the Sydell Group (responsible for the NoMad hotel in New York and the LINE hotel in Los Angeles). The Saguaro has wheelchair accessible rooms and facilities with grab rails, lower bathroom sinks, higher level toilets and accessible parking. 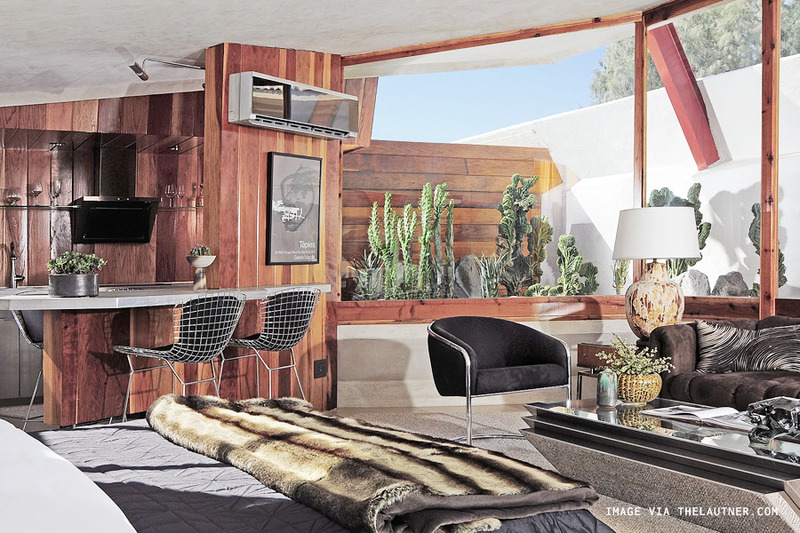 Like many hotels in Palm Springs, The Lautner has lived many lives. The original property was designed in 1947 by American architect John Lautner, who was also an apprentice of Frank Lloyd Wright. It was commissioned by a famous director with the hopes of becoming an escape for the Hollywood elite, but instead sat unoccupied for nearly twenty years. 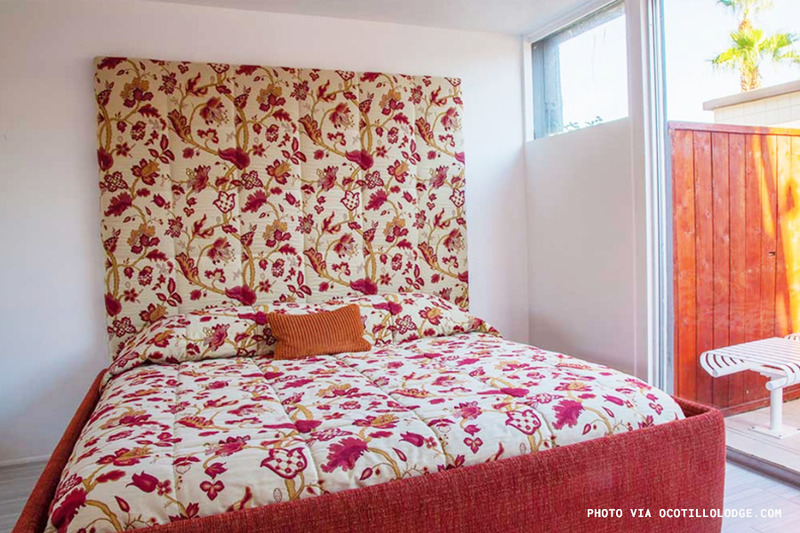 After exchanging hands a few times, in 2008 the property was eventually acquired by an interior and furniture designer duo who renovated and reopened the hotel in Lautner's name. 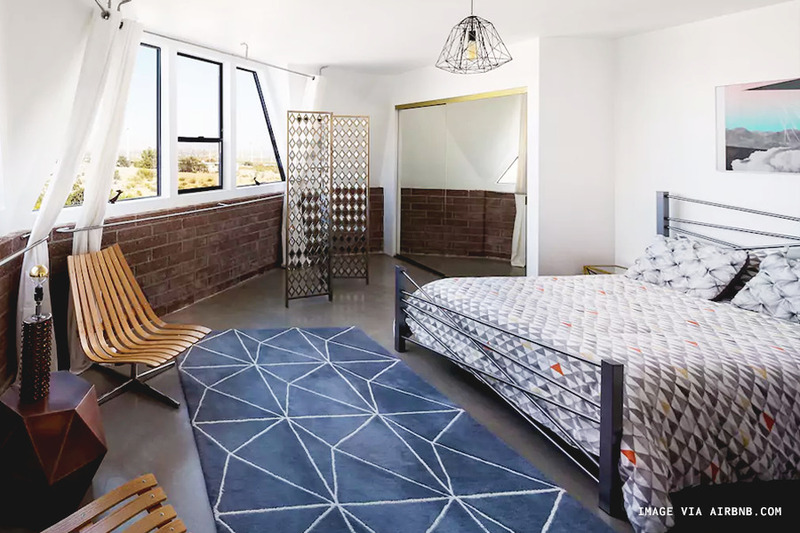 The Lautner is compromised of four units, each with their own micro-kitchen, living area, and a gorgeous mix of wood paneling and cement walls. Access to the units requires going down a short flight of interior steps. We recommend directly contacting The Lautner for more information on accessibility. Children or adults under 21 are not permitted at the hotel. Ocotillo Lodge is a condiminium complex with a few units available as vacation rentals. Built in 1956, Ocotillo Lodge was the first collaboration between two of the most influential names in Palm Springs real estate: the Alexander Construction Company and architects Dan Palmer and William Krisel. Krisel is often credited with designing the iconic "butterfly roof" spotted all over Palm Springs. 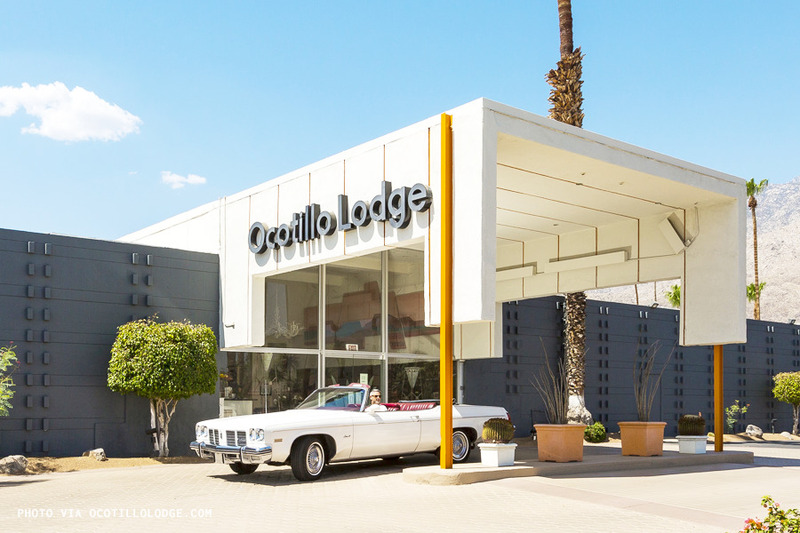 The lodge was originally designed with traveling executives in mind, as the Alexanders predicted that Palm Springs would eventually become more than just a celebrity vacation spot, but a year-round business hub too. We recommend Ocotillo Lounge for long-term stays because of the modern and spacious kitchens in each unit and the hefty one-time cleaning fee. Ocotillo Lodge does have accessible rooms. Units vary by owner so we recommend checking directly with the host for more accessibility information. This unique home is located in Palm Spring's iconic wind farm, and was originally built in the 1950s as a vacation home. In the 70's the owner purchased a commercially available geodesic dome kit which he installed around the exterior of the home. Curiously, the dome had very few windows and under-utilized the surrounding vistas. 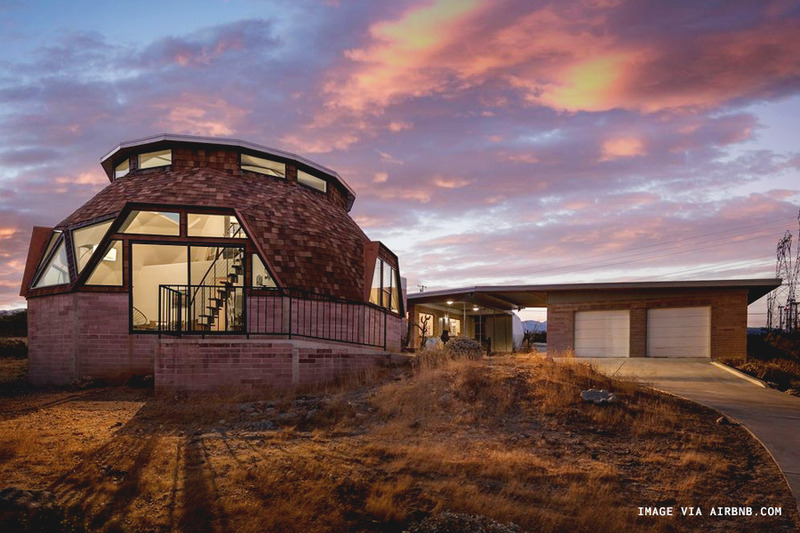 A few years ago the home was purchased by an architect who redesigned the dome with more windows and refurnished the home with traditional mid-century furniture. The home can occupy up to 6 guests in 3 bedrooms. There are ground floor units at The Dome House, but we recommend directly contacting the Airbnb for more information on accessibility. Follow the Dome House's Instagram account for 10% off your stay. The Rendezvous B&B was originally opened in 1938 as The Mira Loma and became a popular hideaway for celebrities like Marilyn Monroe and Veronica Lake. 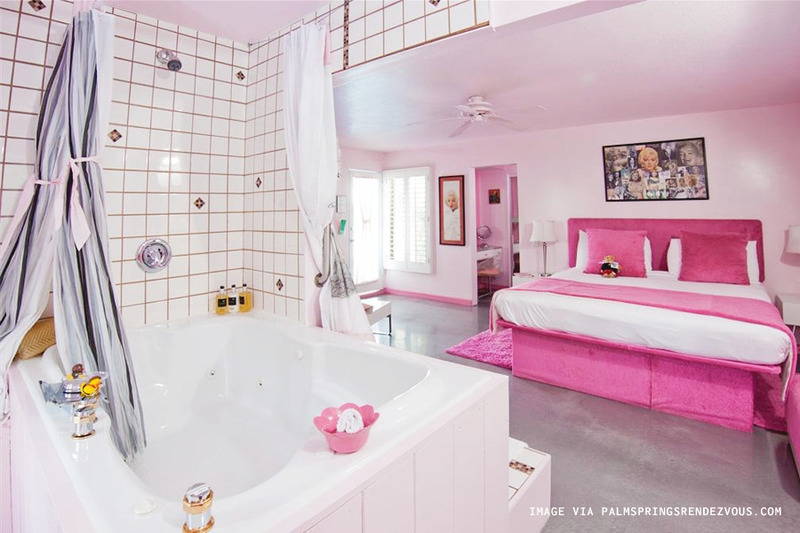 Each room is uniquely themed and decorated, our favorite being "Pretty in Pink", which was originally Marilyn's room of choice. The historic B&B recently added a commercial kitchen in 2008 and of course, breakfast is included with your stay. All units at The Rendezvous B&B are located on the ground floor. 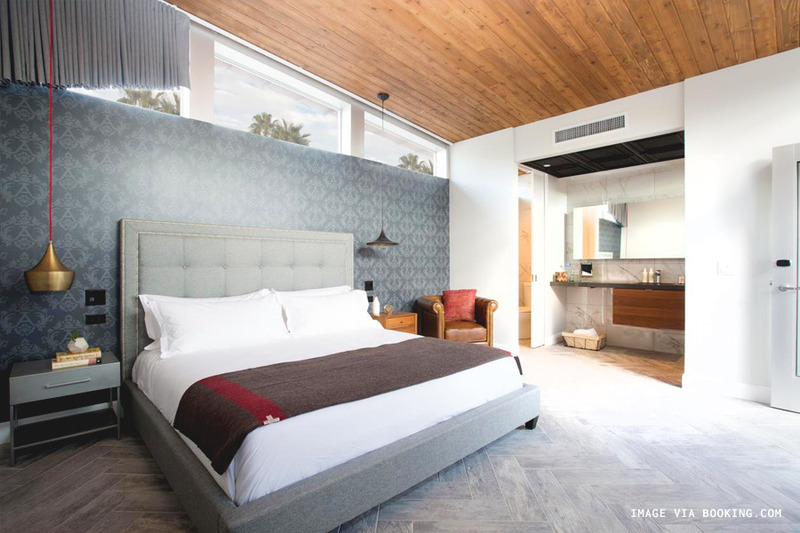 While almost all of the other hotels on this list are renovations of existing building, Arrive, which opened in 2016, marks the first new construction hotel in Palm Springs in over 30 years. The 32-room hotel was started by two Four Seasons alumni and, surprisingly enough, a few Facebook and Amazon alumni. Which actually kind of makes sense considering the hotel boasts having outlets in all the right places, and text-support for accessing hotel services. Arrive has facilities for disabled guests. 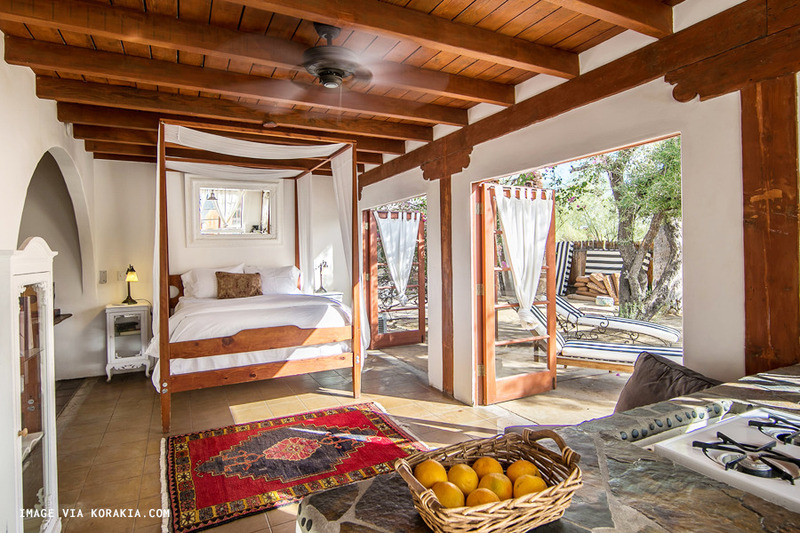 For those who feel underwhelmed or exhausted by the mid-century stylings in Palm Springs, look no further than Korakia Pensione for something a little different. 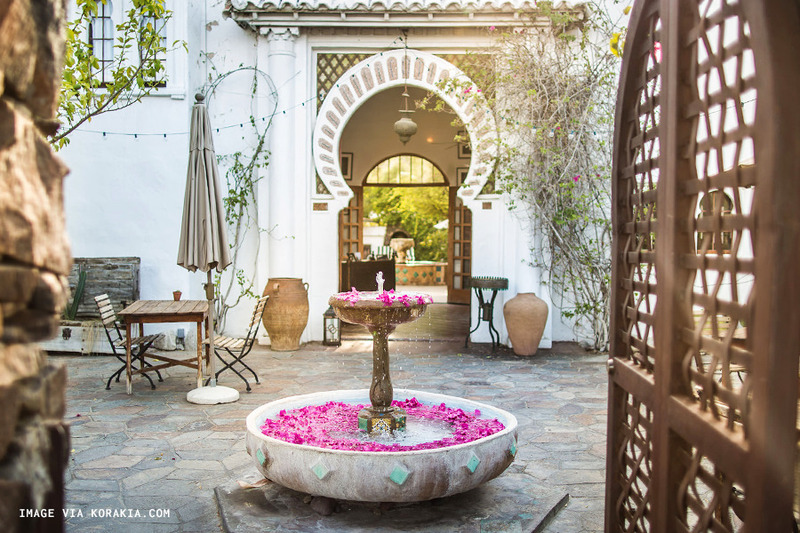 The hotel is composed of two restored historic neighboring villas— one built in the Mediterranean style while the other evokes Moroccan architecture and decor. The Moroccan villa was originally the home of a Scottish painter, Gourdon Cotts, who spent much of his early life in Tangier. The Moroccan villa's "Artist Studio" has hosted many famous American artists like Grant Wood, while the Mediterranean Villa's "Delphi Room" is the most affordable unit at the resort. We recommend directly contacting Korakia Pensione for more information on accessibility.